When we purchased our basset Lucy from a pet store the AKC papers provided a space for us to print her registered name. We decided to include her name, Lucy, and added some extra words to make her name unique as suggested on the form. After some thought and discussion the name Lucy Woebegone Big Paws was selected and the AKC accepted her name. While Lucy didn’t truly have big paws like a basset should we thought they might get bigger because her father was Barnaby Big Foot. Obviously Lucy didn’t inherit that quality from her father. As we moved ahead with our purchases of basset hounds we bought four males from two different breeders. When we registered them we included the “kennel name” of their breeders in their registered names. It wasn’t until we bought our first basset hound girl for showing and possible breeding that we started thinking of our own kennel name. While we thought it might be a little premature to include a kennel name as part of her name a check with other breeders told us that it was appropriate. That’s when we seriously started thinking of a name for our kennel. We still thought that bassets were very woebegone in appearance. Their sad eyes and droopy skin just gave them that sad look. In honor of Lucy we decided that Woebegone would be a great name for all our bassets. As we looked at the AKC registration application at the time we noticed that it had a limited number of boxes for the name. Since Mandy came from Vogue Bassets we wanted that in her name too. Our males were all named for beers, but we thought that wasn’t appropriate for the girls. We considered wine and soft drinks. For some reason we thought that Mountain Dew was a great choice for her. Due to the AKC’s requirement to fit the name within the limited number of boxes we came up with Vogue’s Woebgon Mountain Dew. We thought that spelling of woebegone would work and help keep our dog’s names within the AKC’s limited number of letters. After using Woebgon in Mandy’s name we decided to keep that spelling for future bassets and it became our kennel name. Today all of our basset hounds carry the Woebgon name which is actually in honor of our very first registered basset hound, Lucy. While she was a very poorly bred basset Lucy taught us that going to a respected and responsible breeder was the only way that we were going to get a good basset hound. She also taught us the importance of breeding the right combination of sire and dam for the best result. That is still our commitment today. We do our best to throughly research and do necessary health testing on all the basset hounds we breed. Temperament and health are our primary concerns along with choosing dogs that match the AKC Standard for Basset Hounds as closely as possible. Our efforts to show our dogs in AKC conformation is a big part of that commitment. Through the adjudication of our breeding stock by licensed AKC judges we are assured that our basset hounds are close to the AKC Standard. We go further than that. We invite other basset hound breeders to assist us in our choices. They give input on our breeding choices and which puppies we need to keep for future showing and breeding. While our basset hounds are truly woebegone in appearance they are certainly not in quality. 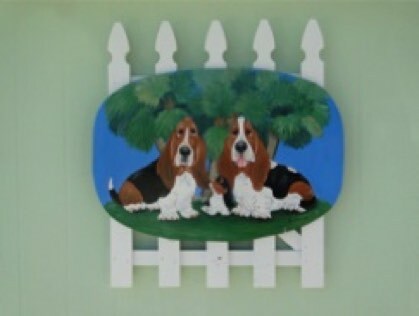 Renee Bane, a close friend, has been painting and drawing whimsical pictures of basset hounds for quite a while. We own some of the pieces she sells to the public plus some special custom pieces she’s made just for us. When we moved into our new home we had to build a workshop/garage. It’s the first building people see when they drive up to our home. We had been thinking of having Renee draw a logo for us and when we realized that there was a large area of blank wall on the workshop portion of the building we commissioned her to draw up a logo for us and make it into a sign for that wall space. Today when people pull up to our property Renee’s sign greets them. When we asked Renee to draw up our new sign we also arranged with her for us to use it as a logo for Woebgon Bassets. It’s what we use on our website and all other forms of communication to represent our bassets. We’re very grateful to Renee for her talent and the excellent job that she did on our logo. Anyone interested in Renee’s art can find some examples on her Etsy page (ArtfulHounds).